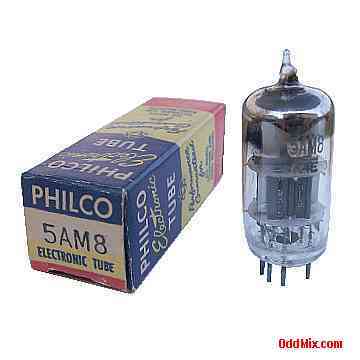 This is an original, discontinued type Philco 5AM8 Diode-Sharp-Cutoff Pentode electronic tube. The pentode part applications included IF, video or AGC amplifier. The high-pervenace diode side was designed to be used for audio or video detector and DC restorer. A collector's special vacuum tube. Excellent for replacement, antique radio, instrument, TV television restoration projects, experimentation, circuit research or to set up a private vacuum tube museum. It is new, unused, boxed, and kept for all these years in mint condition. First come first serve, one available!